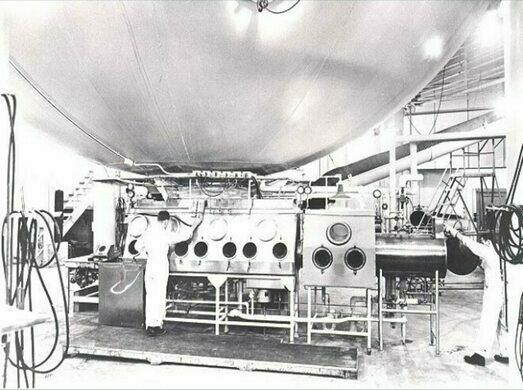 The One-Million-Liter Test Sphere, aka “The 8-Ball,” is undeniably an impressive structure. 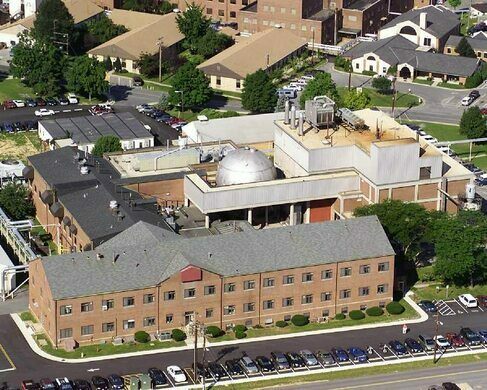 It’s the largest biological warfare chamber and testing facility of its kind ever made, at least as far as we know. 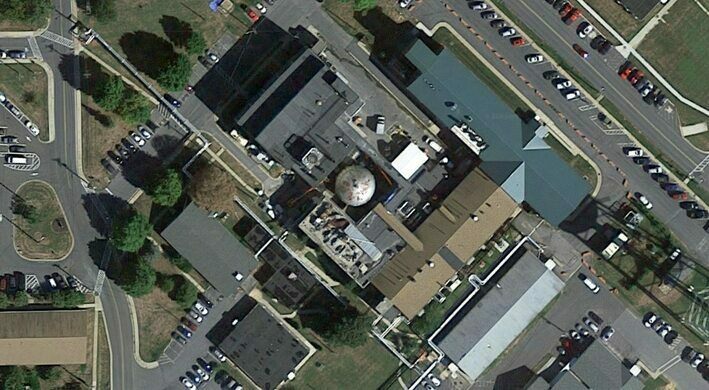 Still, there’s something sinister about this now nonoperational sphere in Fort Detrick, Maryland, in which explosive disseminators were once used to test pathogens against animals and human volunteers. Back when it was operational, “The 8-Ball” looked like something the Red Skull would build in a cliff-top Nazi fortress before Captain America came in and smashed it all. Test Sphere 527, as it was also known, was a 40-foot-diameter steel sphere with a one-inch-thick carbon steel hull and a one-million-liter total volume. Total weight: 131 tons. For most of its operational existence, which stretched from 1951 to 1969, it was enclosed within a 60-foot cube-shaped building sheathed in metal. The sphere itself was gas tight and climate controlled, and the entire complex routinely rated on a slight negative pressure so that any leaks would only allow clean air to enter, rather than allowing contaminated air to escape. The point of all this was for the aerobiological study of “agents highly pathogenic to man and animals,” including nasty airborne biological weapons. “Hot” biological bombs were detonated inside the sphere, and the pathogen-filled munitions were tested in various ways. 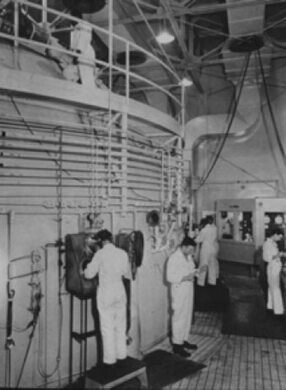 Around the equator of the sphere were a series of access ports and test chambers. Some of these cabinets were for sample collection and for exposing small animal species, up to the size of a monkey, to the pathogens. Another access port was for the whole-body exposure of larger animals, including sheep and goats. A further four exposure cubicles were designed specifically for exposing human volunteers via masks. The sphere was used most notoriously during the Operation Whitecoat study that began in 1954 (shortly before the start of the Vietnam War). This biodefense medical research program was carried out by the United States Army at Fort Detrick, using volunteers who were all conscientious objectors. These volunteers included many Seventh-day Adventists who wished to remain noncombatants but still help with the war effort. The purpose of the research, they were told, was to help defend troops and civilians against biological attacks. Whether that was entirely true and no offensive capabilities were being tested is open to debate. 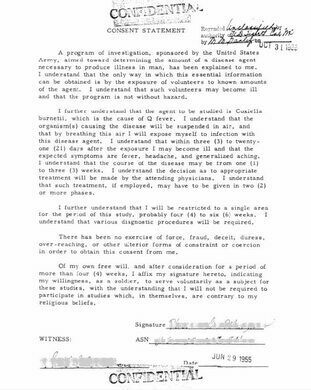 But many vaccines that are used to protect against biowarfare agents and viruses were first tested on human volunteers during Operation Whitecoat. And despite years of volunteers being hooked up to “The 8-Ball” and breathing in infected air, none died, at least during the test period. What happened to the majority of them after the tests is largely unknown. Of the 2,300 volunteers who took part in the various tests, the army has addresses for only 1,000. And of that 1,000, only 500 of the Whitecoats, as the volunteers became known, were ever surveyed after the tests had finished. The test sphere was last used in 1969. In 1975, the building housing the sphere burned down, but the sphere was largely undamaged. Today, it sits nestled and exposed between buildings at Fort Detrick, a decontaminated and decommissioned relic of the Cold War. Due to its historic significance, it was placed on the National Register of Historic Places in 1977. One of the only spherical 19th century gas containers left today.